Home > Car Care > When do the control arms need to be replaced? Automotive technology in today's cars advances fast, especially in electronics, but basic mechanical components see little change. A control arm is the perfect example. It's still a vital part of the front suspension, whether it's the 50's classic or the most advanced modern car. Front end parts, including control arms were troublesome in many cars in the past. Lower control arm in a MacPherson strut layout. In recent years, the quality of mechanical components has improved. Does that mean you don't have to worry about front end repairs? No, the mechanical components still wear and fail, although many parts do last longer. 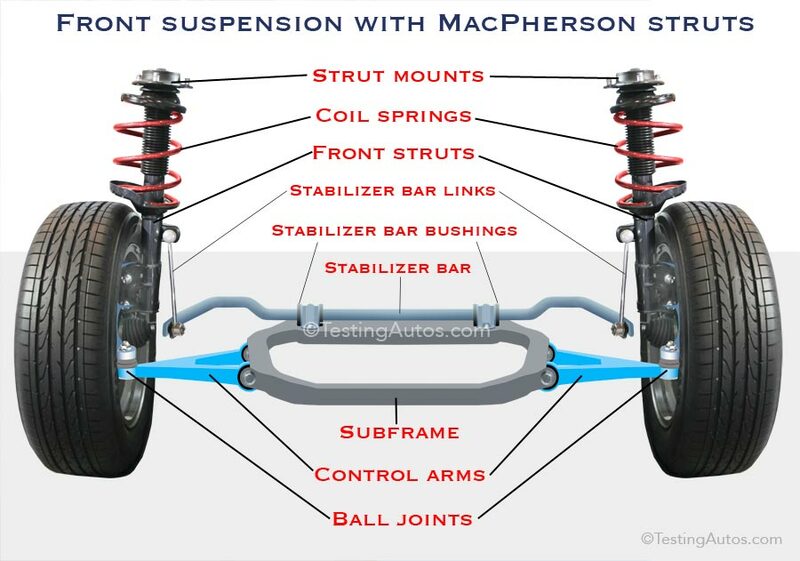 How a control arm works: In a front suspension layout with McPherson struts found in most cars on the road today, there is one "lower" control arm on each side. The inner side of the arm is attached to the subframe or body of the vehicle via rubber bushings to dampen road noise and vibration. The bushings provide a pivot points, allowing the control arm to swing up and down, following the wheel, when the vehicle drives over bumps. The outer end of the arm connects through a ball joint to a steering knuckle, the part that carries the front wheel. 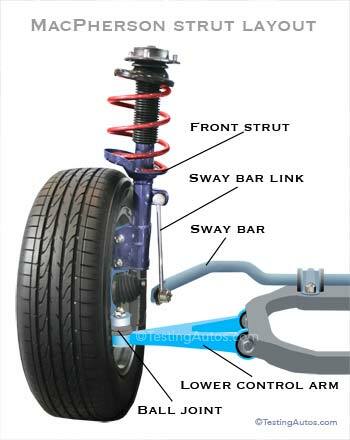 A stabilizer bar connected to both lower control arms or struts keeps the car stable in turns. See this illustration of the front suspension. In some cars (e.g. 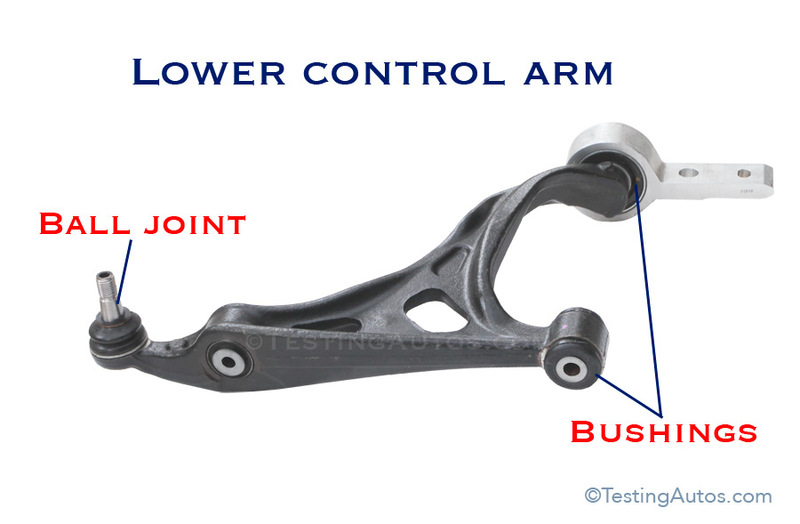 BMW), a control arm is made as a single beam with a ball joint on one side and a single bushing on the other side. In this case, there is another arm or link, that controls the longitudinal movement of the wheel.In most cars, a control arm has an A-shaped or L-shaped design. In a double-wishbone ("double A-arms") layout (in the image), the steering knuckle is held by two, lower and upper control arms. Lower and upper control arms in a double wishbone front suspension. A double wishbone layout is used in many pickup trucks, large SUVs, many high-end vehicles and race cars. The upper control arm is smaller. The larger lower control arm carries most of the load. Both lower and upper control arms have a ball joint, although the upper ball joint is often smaller. When the wheel drives over a bump, both arms swing up and down on rubber bushings following the wheel. In either layout a control arm is a very important component. If it fails, the safety of the vehicle is compromised. There are several reasons why a control arm needs to be replaced. 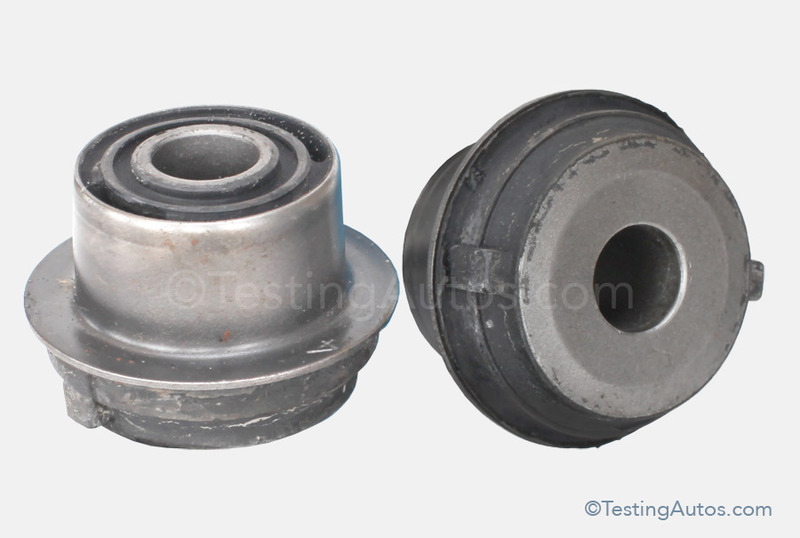 The most common reason is when a ball joint wears out, and it cannot be replaced separately. 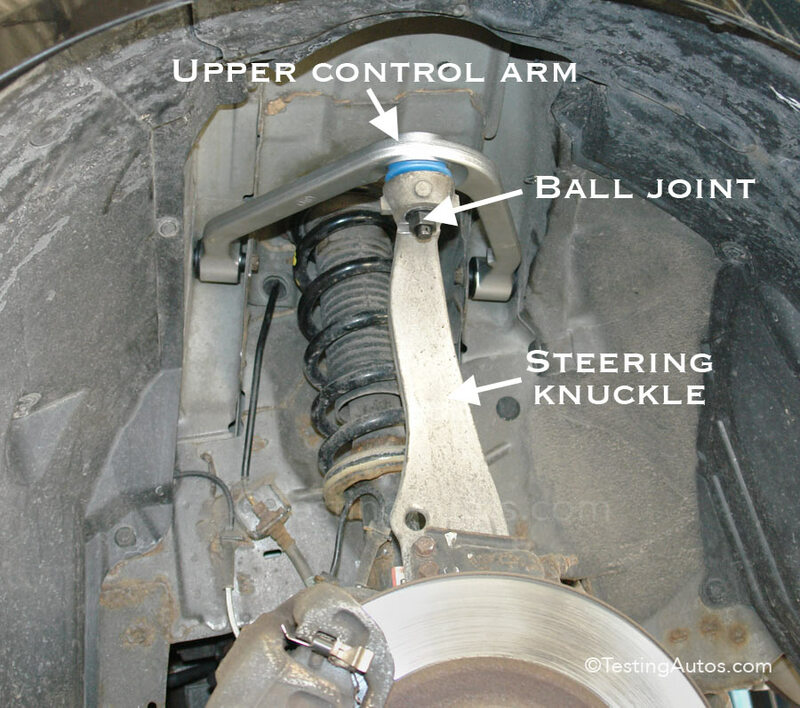 Often a ball joint comes with a control arm as one unit. Lower control arm of the Ford F-150 pickup truck. A worn-out ball joint can pop out causing the vehicle to lose control while driving. This means that a vehicle with a worn-out ball joint is unsafe to drive. Unfortunately, symptoms of a worn-out ball joint are rarely noticeable. Your mechanic can check ball joints, control arms and other components during a regular service, but this only can be done when a car is lifted on the hoist. Worn-out or cracked control arm bushings is another reason to replace a control arm, although in many cars, the bushings can be replaced separately. See this photo of control arm bushings. Another reason to replace a control arm, is when it has been damaged or bent after hitting a pothole or curb. The choice whether to replace only a ball joint or bushings or the entire control arm often depends on the price, the overall condition of the arm and part availability. What is more cost-effective? Prices to replace one control arm in a car or medium-sized SUV vary from $220 to $530. This repair is more expensive on larger SUVs and pickup trucks: $520-$890 for one control arm. 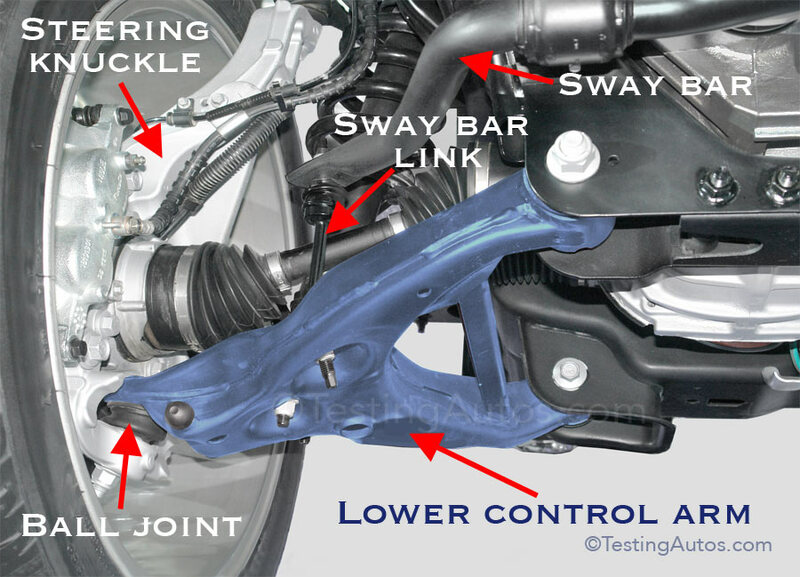 If a sway bar link is seized and cannot be removed without damaging, or it's not in a very good shape, it's usually replaced together with a control arm. A sway bar link is not expensive ($15-$30 for the part). Read more: When to replace sway bar links. Due to importance of a control arm for the safe driving, we recommend using only high-quality parts. Cheap knock off control arms, ball joints and other suspension components are known to fail prematurely. 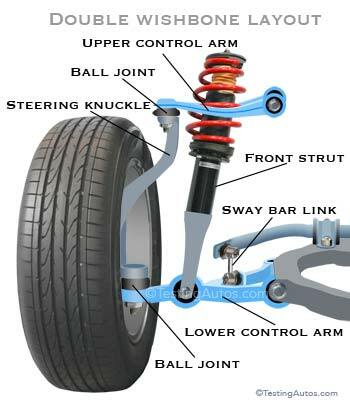 After a control arm is replaced, in most cases, the wheel alignment needs to be performed to bring the steering and suspension angles back to within the specifications. It's not necessary to replace both control arms if one is bad, but often they wear out at roughly the same mileage. If one arm is bad and the other is on its way, it makes sense to replace both arms at once. This way, you only need to do the wheel alignment once.